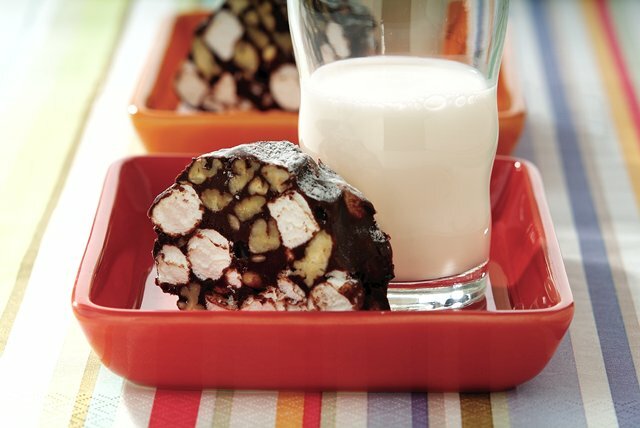 Mini marshmallows and pecans are drenched in melted chocolate, shaped into logs, coated with powdered sugar and sliced into scrumptious treats. Microwave chocolate and butter in large microwaveable bowl on HIGH 2 min. or until butter is melted. Stir until chocolate is completely melted; cool slightly. Sprinkle 2 Tbsp. sugar onto large sheet waxed paper. Combine marshmallows and nuts in large bowl. Add chocolate mixture; toss to coat. Divide mixture in half; place on prepared waxed paper. Shape each half into 8-inch log; sprinkle with remaining sugar. Refrigerate 2 hours or until chilled. Cut each log into 8 slices. Substitute BAKER'S ANGEL FLAKE Coconut for the powdered sugar. Prepare as directed, using JET-PUFFED FUNMALLOWS Miniature Marshmallows.